I have been working on another game, titled 'EnchWood'. This game will be a rouguelike, and written in ICE. I have made numerous optimizations to the game's sprite data, which I will explain below, in the hopes that I'm not the only one to make use of this method. The engine concepts are done, but not the actual engine. An 8x8 pixel sprite on the TI-84+CE (in ICE, Asm, and C) is 66 bytes. Using this method, it is possible to fit 256 sprites (8x8 pixels each), a size of 16896 bytes, into only 1536 bytes! So I'll start with the compressed data (written in binary), and decompress it, step by step. Those dibits (2 bits each) are used as 'weights' for randomizing areas of the end product: an 8x8 sprite. The higher the dibit, the higher the result is likely to be. The result of this is used to get one of the 'meta' nibbles, and the resulting nibble is used to get a color from the current palette. The randomization is done for each pixel of the resulting sprite. The resulting sprite varies due to the randomness. This result is then used as an index for an 8bpp (xlib) palette, and can finally be displayed. Yes, I know that this method is nothing new, but it might be new for some people. Do you have to have a modified xlibc palette for these to make sense visually because there’s no difference between high values and low values except for the blue component? 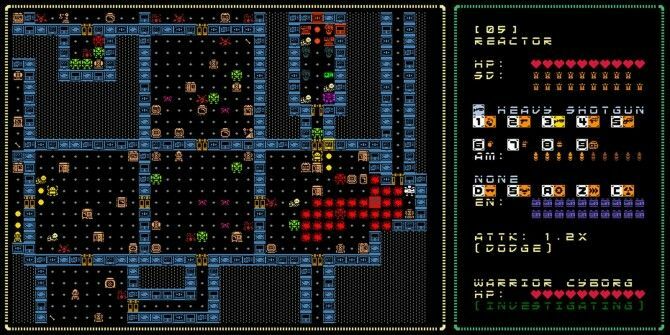 I really like roguelike games and i really hope you will arrive to follow your idea to arrive on a complete game version to share with our community. Concerning your compressing method 1/11 is a very very good rate ! The final resulting sprite is a set of palette indexes. The palette varies by area, allowing for more color customization. I have a couple palettes at the moment, but I plan for at least 4. Also how are you the tile map? How does you movement work? © Copyright 2000-2019 Cemetech & Christopher Mitchell :: Page Execution Time: 0.200743 seconds.